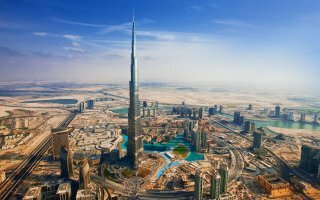 The UAE's economy is the most diversified in the Gulf Cooperation Council, with its most populous city of Dubai emerging into a global city and international aviation hub. Nevertheless, the country remains extremely reliant on its export of petroleum and natural gas. The UAE's oil reserves are the seventh-largest in the world, while its natural gas reserves are the world's seventeenth-largest. The late Sheikh Zayed, ruler of Abu Dhabi and the first President of the UAE, oversaw the development of the Emirates and steered oil revenues into healthcare, education and infrastructure. Although United Arab Emirates have the most diversified economy in the GCC, the UAE's economy remains extremely reliant on oil. With the exception of Dubai, most of the UAE is dependent on oil revenues. Petroleum and natural gas continue to play a central role in the economy, especially in Abu Dhabi. More than 85% of the UAE's economy was based on the oil exports. UAE law does not allow trade unions to exist. The right to collective bargaining and the right to strike are not recognized, and the Ministry of Labor has the power to force workers to go back to work. Migrant workers who participate in a strike can have their work permits cancelled and be deported. United Arab Emirates' economy is highly dependent on the exports of oil and natural gas (40 percent of total exports). Others exports of UAE include pearls and other precious metals and stones, machinery, sound recorders and parts, transport vehicles. Main export partners of UAE are Japan, India and Iran, South Korea, Thailand and Singapore. The economy of the United Arab Emirates is the second largest in the Arab world (after Saudi Arabia). 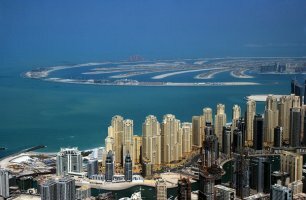 The United Arab Emirates has been successfully diversifying its economy. 71% of UAE's total GDP comes from non-oil sectors. The UAE is a member of the World Trade Organization and OPEC. Dubai suffered from a significant economic crisis in 2007-2010 and was bailed out by Abu Dhabi's oil wealth. Dubai's current prosperity has been attributed to Abu Dhabi's petrodollars. Dubai is currently in extreme debt. Tourism is one of the main sources of revenue in the UAE, with some of the world's most luxurious hotels being based in the UAE. Although the UAE is now less dependent on natural resources as a source of revenue, petroleum and natural gas exports still play an important role in the economy, especially in Abu Dhabi. A massive construction boom, an expanding manufacturing base, and a thriving services sector are helping the UAE diversify its economy. Nationwide, there is currently $350 billion worth of active construction projects. UAE top imports are gold, jewelry, broadcasting equipment, cars and refined petroleum. Main import partners are India, China and United States, Germany, Japan and South Korea. The United Arab Emirates is a country situated in the southeast end of the Arabian Peninsula on the Persian Gulf, bordered by Oman, Saudi Arabia, Qatar and Iran. The UAE is a member of the International Chamber of Commerce, Organization of Petroleum Exporting Countries, United Nations Conference on Trade and Development, World Customs Organization, World Trade Organization and other international organizations. A customs duty of 5% is generally levied on imported goods (a number of categories are exempt, some agricultural products and pharmaceuticals) and luxury goods such as tobacco is 50-70%. A number of UAE ‘free zones’ have been established, where customs duties are not payable, such as Dubai International Financial Centre (DIFC) or Jebel Ali port. Goods may only be imported by an entity which is registered in the UAE. Only companies in the UAE that have the appropriate trade licence can import products into the country. Import controls exist for a number of products including alcoholic beverages, pork and pork products, medicinal substances, printed matter such as magazines and videos, photographic material, firearms and fireworks. Goods should be packed to provide protection against extreme heat and humidity, storage in the open and possible unloading into lighters. The UAE Ministry of Health requires all pharmaceutical imports to be carried under temperature controlled conditions of 25 degrees centigrade. Outer containers should bear the consignee's mark and the port mark in Arabic, this is essential, as most wharf labourers cannot read English. The appropriate tariff number should be shown. This should ensure the correct freight rate is applied to the items shipped. Original copy must be furnished (two original copies minimum). Original bill if ladings have to be endorsed by the shipper. In case they are not endorsed, a full set (usually three) of originals need to be surrendered to the line. A packing list is required, but there is no prescribed format. The certificate of origin must include the name and address of the manufacturer. At the time of clearance, in case of original commercial invoice, if the certificate of origin and packing list is not available, clearance can be affected on the strength of photocopies and a deposit, which can be claimed back if the originals are submitted within 60 days of filing the bill of entry. Livestock are inspected upon arrival. Agricultural pesticides may only be imported by a registered importer holding a valid import licence. Imports of pharmaceutical products are subject to specific transport regulations. Food containing cyclamates is prohibited from entering Abu Dhabi and although there is no legislation prohibiting such food from entering Dubai, the practice is not encouraged.